[SatNews] Cobham SATCOM is teaming up with Network Innovations, Inmarsat and Danish broadcaster TV2 at IBC 2015. Reflecting the importance of partnerships, this quartet of SATCOM innovators will demonstrate a diverse new wave of hardware, Ka- and Ku-band VSAT services and innovative new L-band solutions, all with the potential to revolutionize outside broadcasting (OB). Mounted on a Mercedes GLK, the brand new EXPLORER 8100 VSAT terminal will form the centerpiece of Cobham SATCOM’s IBC presence, outside on Stand 0.G04. As the world’s first and only Stabilized Auto-Acquire Drive-Away antenna, the new EXPLORER 8100 VSAT overcomes the challenges of vehicle movement for land ‘Comms-On-The-Pause’ users. It is especially relevant for the growing population of small and rapidly deployable outside broadcast production teams. Transmitting live from the RAI in Amsterdam, Cobham SATCOM will demonstrate how the unique stabilisation technology of EXPLORER 8100 VSAT can maintain consistent link conditions on Eutelsat’s Ka-band NewsSpotter service provided by Network Innovations (2.A46), even with people getting in and out of the car. In parallel to demonstrations on EXPLORER 8100 VSAT, Cobham SATCOM will conduct live demonstrations on the Inmarsat Global Xpress service, using the new EXPLORER 5075GX Auto-Deploy Fly-Away VSAT antenna solution. 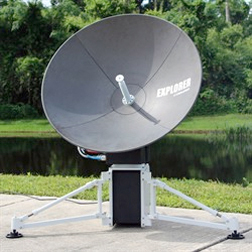 Featuring a highly robust design, developed 100 percent in-house, EXPLORER 5075GX was the first antenna to transmit live on the Global Xpress service and has already been used in the field by a major broadcaster covering the earthquake in Nepal this April. Cobham SATCOM will be transmitting live from its booth outside to the Inmarsat booth inside (2.B19) using its sophisticated antenna. EXPLORER 5075GX utilises a new 75cm 4-segment reflector and along with the EXPLORER 3075GX is the only Global Xpress terminal available that includes integrated Wi-Fi. Cobham SATCOM will also demonstrate live Inmarsat BGAN HDR bonding, using a satellite link from its booth to the Inmarsat booth. HDR bonding is a relatively new development, where two BGAN terminals can be combined to double the live streaming and data transfer throughput on the BGAN service. In-use, the system can deliver a guaranteed Quality of Service over 1 Mbps; enough capacity to stream high quality footage, from a hardware package compact enough to fit in a backpack. Cobham is also highlighting the extraordinary potential of IP connectivity. Working together with Danish broadcaster, TV2, a Mercedes GLK will be transformed into a fully functional studio with equipment such as cameras and lights controlled remotely over IP. This concept has already been tried and tested in a Tesla electric car during the Danish general elections in June this year, where TV2 handed the vehicle to Danish politicians driving between campaign sites while debating current issues on the way. The broadcaster generated high quality election news footage from the car, with no production staff present during filming.